Over 300 renowned writers, poets, translators, editors, artists, public intellectuals and cultural workers, from Alice Walker and Claudia Rankine to Naomi Klein and Jacqueline Woodson, have signed the petition to free Dareen Tatour. For the list of signers, please scroll down. Dareen Tatour has been charged with incitement to violence based on a poem posted to Youtube. She is one of over 400 Palestinians arrested in the last year for their expressions of resistance to the Israeli Occupation over social media. She had her first court hearing last month, charged by Israel for Facebook postings and a poem posted to YouTube called “Qawim ya sha’abi, qawimhum” (Resist my people, resist them). We believe in the rights of artists and writers to openly express their artistic vision and share work freely. The Israeli government’s actions reveal a desire to silence Tatour, part of a larger pattern of Israeli repression against all Palestinians. Expressing resistance to oppression and Occupation through poetry is by nature non-violent and should not be criminalized by any government. We, the undersigned – writers, artists, and people of conscience from around the world – believe that poetry is not a crime. We are calling for poet and activist Dareen Tatour to be released immediately from house arrest and for all charges to be dropped. Dareen TatourDareen Tatour is facing imprisonment for her poetry in Israel/Palestine. 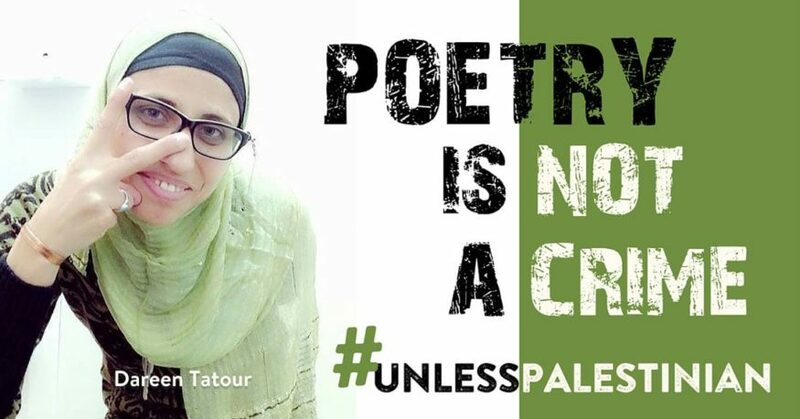 Palestinian poet Dareen Tatour was arrested on October 11th, and has been detained ever since. Her crime? Poetry. A poem of Tatour’s was posted on Youtube, and her reading of another poem at a Women’s Day commemoration in Nazareth. Tatour spent the first three months of her detention in three prisons – Kishon, Damon and Hasharon. She was then transferred to house arrest, but the court insisted that she be kept 40 km away from her home because of the ‘danger’ she posed to the public. This outrage cannot stand, and we are pressuring the Israeli government to free her with a sign-on letter from writers, poets, and artists. Signers represent some of the most respected and renowned individuals in the arts and literary worlds including ten Pulitzer Prize winners, fourteen recipients of Guggenheim Fellowships, an NAACP Image Award winner, many Lambda Literary Award winners, and scores of recipients of the highest U.S. writing, translation, and arts honors: including Tony Awards, Grammy Awards, Obie Awards, PEN/Open Book Awards, National Book Critics Circle Awards, Kenyon Review Award, Pushcart Awards, LA Times Book Awards, and MLA Prizes. Say it again, resist times ten. we would have done anything for you, Palestine. But all we knew to do was talk, talk, to everyone who already agreed. really stand up for you — what else could we do? Talk to those who didn’t already agree? But who were we? after being tear-gassed in her own room by Israelis. She wasn’t angry – we were. no trouble trapping, oppressing, squelching, giving another name. and the sleeping person shouted from the nightmare, Wake up! Just let me wake up! 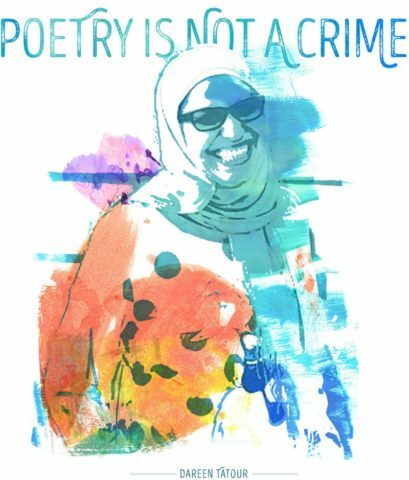 Over 300 renowned writers, poets, translators, editors, artists, public intellectuals and cultural workers are calling for Palestinian poet Dareen Tatour’s release from house arrest. All identifications and affiliations are for identification purposes only and do not imply endorsements by any institutions. Winner of the European Union Literary Award in 2012 and the South African Literary Award in 2013 for the novel Khalil’s Journey. Wrote Turning Japanese (Josephine Miles PEN Oakland Book Award), The Last Incantations, Where the Body Meets Memory. Primary translator of Octavio Paz into English. Recipient of the National Book Critics Circle prize for criticism. Winner of PEN’s Gregory Kolovakos Award. Enrolled at Turtle Mountain, North Dakota, USA. Works include: The Book of Hulga and The Alphabet Conspiracy. Distinguished Professor of the Humanities, City University of New York-College of Staten Island, Playwright, Novelist. Author of False Prophets of Peace.